The creative design agency Clickworks have become the first Irish company to win an award from the prestigious Design Business Association (DBA). DBA annually dispense the coveted Design Effectiveness Awards for agencies and design teams who produce the finest “strategic and effective design”. Clickworks, whose headquarters are based at Burlington House on Waterloo Lane, were recognised with a bronze award for their work on behalf of the charity Aware, a charity dedicated to the awareness and treatment of sufferers of depression. The winning design portfolio was for the charity’s Life Skills campaign, a group of free programmes intended to promote the use of Cognitive Behavioural Therapy to help build self-esteem and cope with day-to-day stresses that can overwhelm those with a tendency to depression (read more on page 11). We spoke with Karina Abbaj, of the Clickworks media relations team, about the award and the company. She explained that the keywords of the Design Effectiveness Awards are creativity and effectiveness. “The aim is always to produce designs which are compelling and easy to follow for the ordinary user,” she explained. “The Life Skills campaign had a high click-through rating, so that’s a sign of success.” Click-throughs are exactly what they sound like: the traffic of users who browse the site compared to the number who click through to the next page. The Life Skills campaign has a click-through rate of 0.018 to 0.89 percent, which might sound vanishingly small but as with all statistics, small deviations are significant. Those numbers put the campaign above the industry standard. Karina explained that the DBA is an organisation for people who believe there should be a bridge that connects good design and business interests. The award is another feather in the cap for a company that represent a peculiar kind of post-Celtic Tiger success story: founded in 2007, on the eve of the economic crash, Clickworks have since tripled the size of their operations, representing charities and financial service providers. 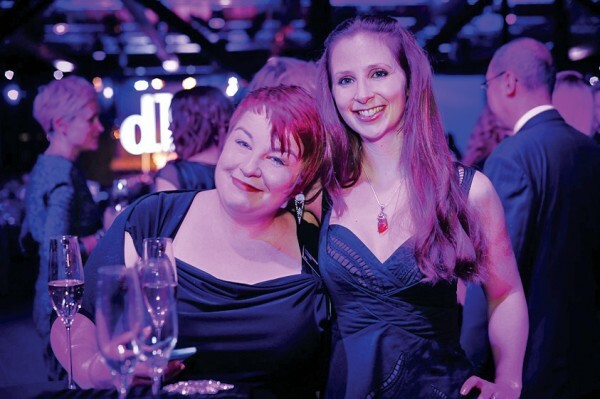 Pictured: Siobhan Griffin (left) and Sorcha Hogan (right) at the Clickwork’s DBA award ceremony. Image by Oleg Tolstoy.